With reference to 1 Peter 5:1-10 the question raised in the lesson is; What are the characteristics of effective church leadership? While this is a valid question the referenced passage comes toward the end of Peter's first epistle and if you were to review the previous quarterly lessons an inductive study leading up to this passage hasn't been accomplished. A better question is; Why are we looking at Peter's closing remarks yet have been given little direct searching and understanding of the rest of this epistle leading up to this quoted passage in the previous quarterly lessons? The previous verse, as can be seen, begins with the word 'therefore' which suggests for us to continue on back, leading to the beginning of Peter's letter before drawing conclusions and asking questions such as has been done in this lesson introduction. If you were to review the previous six weeks of lessons for this quarter you will find that this has not been done. Picking 'sound bits' of Scripture throughout the bible, even when in somewhat of a local context may be the way to search out a specific theme or topic however this certainly is not the way to understand a particular book of the bible without simultaneously studying the original Holy Spirit inspired author's letter in the manner it was written. The quarterly title implies we are going to learn the Apostle Peter's message in these two epistles. 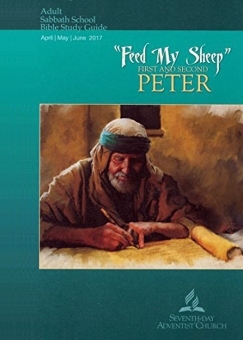 Instead, only selected portions of First and Second Peter have been included in pursuit of something different, the quarterly lesson author's own agenda. "What are ways that you can learn to work better with the leaders in your local church, even when you don’t always agree on things?" This is much to broad of a question because a proper response to the question depends upon; What is the specific issue of the person who is in disagreement with the church leadership? Most issues including biblical doctrine should find agreeable resolution in a body of Holy Spirit led Christians because all true Christians are under the same leadership of the Lord and Savior Jesus Christ. The Bible however should be the final authority when the issue is; What is truth? When it is an issue of doctrine it is best for those who don't agree with Adventist doctrine, such as the Investigative/Sanctuary doctrine versus learning Scripture clearly teaches that a sinner covered by the blood of Christ is eternally secure in the kingdom of heaven, to leave and have their membership removed in a mutually agreeable manor. Since Adventist leadership is unable to provide a biblical foundation for this one unique unbiblical doctrine it is hypocritical to only remove such a person from membership on grounds of apostasy when that is their reason for leaving. It is not apostasy to reject the Investigative/Sanctuary doctrine founded upon what Scripture teaches. The lesson examines the role of an elder by first establishing what are the requirements for becoming an elder with reference to 1 Peter 5:1-4 but then redirects our attention to other Scripture references without first actually studying this passage. "Peter likens the role of an elder to a shepherd tending the flock of God. His comparing a church to sheep suggests that, like sheep, members can sometimes go off on their own. Thus, they need the shepherd to guide them back to the group and to help them work in harmony with it. The elder also should function as a humble example of how a Christian needs to act." While this statement does well in describing the behavior and function of an elder it ignores one critical requirement for becoming an elder. Even though it may seem obvious it needs to be stated that like all other members of the Body of Christ in the local church an elder must be a mature christian whose own sins are covered by the shed blood of Christ and that, as an elder, you know you have been eternally transferred out of the kingdom of darkness and into the kingdom of God. Since First and Second Timothy were expressly written to provide specific qualifications and duties for becoming either an elder or deacon it is rather odd that the lesson for today makes no reference to these epistles. "His comparing a church to sheep suggests that, like sheep, members can sometimes go off on their own. Thus, they need the shepherd to guide them back to the group and to help them work in harmony with it." In the context of the lesson "the group" obviously means Seventh-day Adventism whereas in Scripture "the group" is restricted to those whose faith is placed on nothing other than the shed blood of Jesus Christ, 1 Cor. 15:1-5. An interesting point that seems to be overlooked by Adventist is that there is no command to be found anywhere in Scripture to worship God on the Sabbath Day. On the topic of worship read Jesus' words in John 4:16-24 on how God is to be worshiped. Paradoxically if you work yourself to exhaustion in preparation for your intended worship on the Sabbath then what you are really doing is breaking the forth commandment you think you are keeping by not staying home and resting as the Old Covenant commanded you to do. Therefore a wise and humble Seventh-day Adventist elder should follow the sheep that have joined a group of born-again believers covered solely by the shed blood of Jesus Christ instead of compelling them to rejoin the false Adventist group. Working the ground to stay alive became a curse and introduced the need for rest from physical exhaustion. The Old Covenant Sabbath rest was only given to the Hebrews, God's covenant people. Their seventh day Sabbath, which specifically portrayed their escape from the slavery of Egypt prophetically pointed to the Messiah, Jesus Christ, as their eternal Sabbath Rest from the curse of sin. Therefore Christians rest in Jesus Christ rather than the Old Covenant symbol that pointed to him. The Jesus' gift of the indwelling Holy Spirit is the sign and seal of the New Covenant, not the Sabbath that pointed to him and Calvary. According to Jeremiah's prophecy God's covenant people as a nation will one day accept Jesus as their promised Messiah. We rest eternally in Jesus Christ in the same way God rested eternally from his six days of creation. God, who never gets tired, rested (meaning he ceased) from his act of creation because it was complete. Heb. 4:1-13 is also telling us that Jesus' atonement for the sins of the world at Calvary is a complete finished atonement. Satan played no part in this atonement then nor will he ever do so. 1 Peter 5:3 and Matt. 20:24-28 are the lesson references used to identify "crucial principles of christian leadership". However, instead of focusing on Scripture the lesson includes an Ellen G. White quote which is commentary on Matt. 20:24-28 where she uses the phrase; "their selfishness". Since the request on who would sit at the side of Jesus came from one person, the mother of the James and John, this quote should have read; "her selfishness". We don't know what her sons part, if any, was in this request of hers. It was the mother's request that Jesus tactfully deflected by informing her that such a decision was for the Father to make, not his. Thus Jesus avoided having a schism amongst the disciples. Otherwise the lesson does well to emphasis that leaders in Jesus kingdom must be servants. The lesson does well to quote Jesus where he said, "...even as the Son of Man came not to be served but to serve, and to give his life as a ransom for many.” While we are command to serve as servants there are at least a couple of differences in our role from that of Jesus. While it is obvious that only God in the person of Jesus Christ is to be worshiped. Our role includes pointing all sinners, in whatever context we find ourselves, to the Lord and Savior Jesus Christ. Sinners still in the kingdom of darkness do not "delight in the law of God". Rather, Paul is describing himself as someone in the kingdom of God yet at the same time must still surrender the sins of the flesh to Jesus Christ for spiritual maturity, ongoing growing sanctification. The question of humility is introduced by first noting that in our sin fallen world this would normally be the proper attitude of the 'lower classes' of society directed upward towards those who rule 'from the top down' whereas, in the Body of Christ, the local church, humility begins with the elders and deacons who are to exhibit this in the way they serve the Body of Christ the Church. When you consider Jesus' instructions on leaders in his kingdom being servants there is one major difference in the humility of a christian versus from that of the world. In the world humility is not a choice whereas all christians, especially those who lead, willingly humble themselves both to each other and before our Lord and Savior Jesus Christ. The best way to understand the uniqueness of christian humility is to examine the biblical account of the interaction between the apostles Peter and Paul along with their common relationship to the Lord and Savior Jesus Christ. Only Jesus is Lord. All else who are in the kingdom of God model their lives after Jesus as servants regardless of their role of leadership. In humility the Apostle Paul humbly submitted himself to both the christian leadership in Jerusalem and the Roman government for the cause of Christ. On questions of doctrine Paul accepted the verdict expressed by Peter because Jesus had given Peter (leadership) 'the keys of heaven and earth', Matt. 16:19, Acts 21:17-26 & 26:30-32. Christians recognize that faith in our Savior without any work of our own is why we have been given eternal entry into the kingdom of God. Humility means to know that works which are truly good works are the result of salvation rather than the cause of our changed new life. In the kingdom of God only Jesus is Lord. All the rest are servants regardless of their title or role of leadership. Humility also means that in the Church the Body of Christ here on earth, no leader would presume to have the authority to alter or adopt doctrine not founded solely upon Scripture, especially as it affects the gospel message of Jesus Christ, Gal. 1:9. Out of humility non of us including our leaders knows more than what Scripture teaches. Today's lesson introduces the "great-controversy theme" with the unstated assumption that the persecution of the apostolic church was simply a part of an ongoing battle between Satan and Jesus. As is the normal practice with Adventists apologist who promote the Great Controversy theme, the foundation for developing and believing this doctrine has been ignored and simply assumed to be true. Adventism teaches that Jesus was Michael the arc angel (mentioned in Daniel, Jude 9 & 1 Thess.) and therefore was once equal to but not greater than Lucifer. In the debate of whether or not Michael is Jesus Scripture never teaches that Jesus was ever anything less than the eternal Son of God equal to, with all the attributes of, God the Father. Adventism teaches that the rebellion in heaven began when God elevated Jesus to the position of Son of God. Adventism teaches that Lucifer felt this position should have been given to him. Out of jealousy Lucifer (Satan) began the heavenly rebellion which resulted in him and his evil angels being cast out of heaven. This information is not to be found in Scripture. Adventism teaches that the Great Controversy is simple an age long war between Satan and Jesus that began with this rebellion in heaven. But since this doctrine does not have scriptural support, a new convert to Adventism is first encouraged to accept the works and role of Ellen G. White as a prophet (of God) before her non-biblical foundation for this belief is revealed. If, on the other hand, you conclude that Ellen G. White is a false prophet then her testimonies should and must be rejected. With that comes the realization that the Great Controversy doctrine is not an explanation of the fall of mankind nor of the evil of this present age we live in. Regardless of the evil of this present age, any perceived personal battle between Satan and Jesus Christ ended at Calvary with Jesus the undisputed victor, Gen. 3:14-15, John 19:30 & Eph. 1:17-23. Our hope in Jesus Christ is a sure hope because of the resurrection of our Lord and Savior Jesus Christ. It is both unethical and dishonest to refer to a doctrine such as this without also revealing the references that supports belief in this theme. The lesson summary for this week focuses on the humility of Jesus Christ through his act of washing the feet of all the disciples including that of Judas, yet fails to search out the full significance of the disciples having their feet washed by the Savior. While 'foot washing' hasn't been commanded as a christian church ordinance it is certainly clear that we are to follow Jesus' example and do to each other as he did to his disciples. The theme of humility is certainly a noble practice to be found within Adventism however this isn't the whole of what Jesus is teaching. For those who have adopted this practice it is appropriate that foot washing be followed up with the taking of the ordinances that represent Jesus' body and blood shed at Calvary. Since this account is on the evening and beginning of the day that Jesus died for the sins of the world at Calvary we should take note of the events that led to the Passover which in the New Covenant becomes 'The Lord's Supper'. In John 12:1-7, six days before the Passover, Mary the sister of Lazarus, whom Jesus had resurrected a few days earlier, anoints the feet of Jesus which were about to be 'bruised by the Serpent', Gen. 3:14-15. According to this promise of God recorded in the Genesis account Jesus would at the same time give a death blow to the 'head of the Serpent'. The significance for us to understand is that when Jesus arose from the grave the atonement was complete and Satan was declared to be totally defeated by Jesus who is the prophesied 'offspring of the woman'. There is no such thing as an ongoing Great Controversy between between Satan and Jesus because it was over and done with at Calvary. John chapter twelve concludes with Jesus' triumphal entry into Jerusalem riding upon a young donkey. We should keep in mind that it was Jesus feet that were prepared for his coming death at Calvary as we move into the next chapter of John. In verses 2, 11 & 21 we see that Jesus is fully aware that Judas would betray him and that Judas was the only one in the room who was not clean. At most we can see that 'foot washing' wasn't about eternal salvation which is something only Jesus, a perfect sacrifice, would accomplish later that same day at Calvary. In this evil age we all "walking in" our spiritual feet need ongoing "washing" by fellow Christians. Jesus example of foot washing certainly illustrates humility but that isn't the primary meaning. One of things Jesus means is that in the fallen sin filled world we live in we will never be perfect. In humility we confess our daily sins to one another. Only until Jesus returns to collect his Bride will we be free of sin. By contrast, John 13:10 reveals the depth and meaning of the gospel message of the death, burial and resurrection of Jesus Christ by comparing it to a bath where we are declared clean by God even though our feet do and still become dirty. Six days earlier Jesus' feet were anointed by Mary the sister of Lazarus. This was a humble servant display of her love for the Savior Jesus Christ in preparation for his burial, John 12:7-8. It is within the context of how Christians are to have a special love for one another that we (figuratively or perhaps even literally) wash the feet of fellow Christians as Jesus washed those of the disciples. Jesus' new command is that Christians are to have love for one another. This is what Jesus' foot washing of the disciples was intended to portray. By this the world will know we are Christians. Our humility is about a special love where we are a servant to all others who are also Christians. Since we are also commanded to take the gospel message to all the world it naturally follows that this same godly love be extended to the lost and perishing of the evil world we live in because the only thing that rescues the lost and perishing of this world from their sins is the shed blood of Jesus Christ. Copyright 2017 BibleStudiesForAdventists.com. All rights reserved. Revised May 1, 2017. This website is published by Life Assurance Ministries, Camp Verde, Arizona, USA, the publisher of Proclamation! Magazine. Contact email: BibleStudiesForAdventists@gmail.com.